On Texel, they call fieldfares tjakkers, since that is the sound they seem to make: tsjaktsjaktsjak. Once you've recognized the sound, you seem to hear it everywhere. 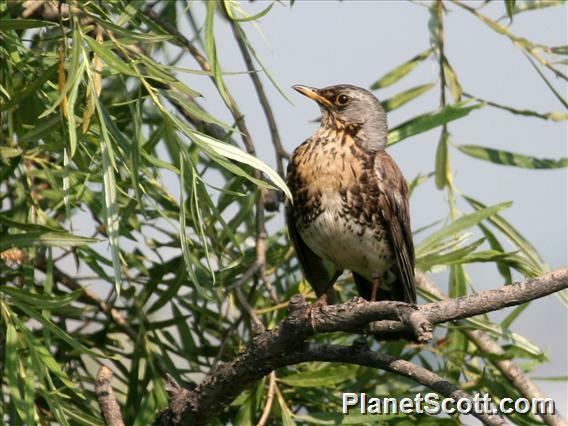 Fieldfares are related to blackbirds and thrush, but are much more colorful. Their grey head and rump are a lovely contrast to the chestnut brown back and the breast is yellow-spotted. They nest in deciduous forests and half open landscapes in northern and central Europe. In the northern part of the Netherlands, you see them mostly during the autumn migration. In earlier times, the residents of the Wadden Islands would catch fieldfares and other members of the thrush family with a trap and sell them as a delicacy.